RIM has caught plenty of flack these past few months, thanks to (among other things) a multi-day global outage, disappointing PlayBook sales, and a dramatic management shake-up. Beyond all of this, the news that their next-generation BlackBerry 10 operating system wouldn’t see the light of day until the latter parts of 2012 seemed like yet another nail in RIM’s coffin. But the beleaguered company is trying to move past all of that at BlackBerry World. While we regular folk still have months to wait until the first BB10 products make it to store shelves, RIM has just officially opened up the BlackBerry 10 platform to developers at BlackBerry World, starting with the release of their BB10 beta development toolkits and the BlackBerry 10 Developer Alpha device. As you may have guessed from the announcement, RIM’s game plan at this point is to give developers as much lead time as possible to develop applications to launch alongside BlackBerry 10, though we’re still no closer to figuring out when that launch will actually take place. In fact, they’ve already managed to gain the support of some considerable third parties — fitness app developer Endomondo has already committed to the platform, as have the mobile game peddlers at Gameloft. Other partners include Occipital, Poynt, Truphone, and PixelMags, to name just a few. RIM hopes that by locking up some big-name partners, they’ll be able to entice smaller developers to take a chance on their platform as well. RIM’s app store numbers pale in comparison to larger rivals like Apple and Google, but representatives we spoke to were quick to spin that as a positive. According to developer focus groups the company held, more than a few beleaguered developers claimed that they could actually be found in BlackBerry App World as opposed to be being drowned out by scores of new submissions in competing app stores. 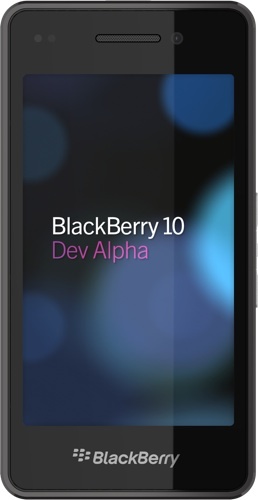 Meanwhile, the move to make the Dev Alpha device available to attendees of RIM’s developer-oriented BlackBerry Jam conference isn’t a surprise, but it’s a clear indicator that RIM is taking the BlackBerry 10 launch environment very seriously. After all, pre-release events for the PlayBook didn’t offer developers that sort of early access, and the company seems determined to learn from their mistakes. All of the leaked Dev Alpha images that have surfaced over the past few days are indeed legit, and while it isn’t much to look at (imagine a scaled-down version of the PlayBook), that’s all part of RIM’s plan. The thousands of devices being made available to developers at today’s BlackBerry Jam event are the same as the devices used internally to test code (save for the additional of some BlackBerry branding), and during our time with RIM they repeatedly confirmed that the Dev Alpha devices bear no resemblance to any BlackBerry 10 devices in terms of either hardware or software. Sadly, this means that we’re still no closer to getting a feel for what BlackBerry 10 will actually look like. It’s a definite bummer, but it was perhaps to be expected — RIM is all about playing the expectations game now, and slapping the BB10 name on a device that essentially only has a web browser and a file system wouldn’t reflect too well on them. As such, they’re also keeping mum on the thing’s specs — aside from the device itself proclaiming it has 16GB of onboard storage, all representatives would confirm is that it has a 4.2-inch screen running at 1280×768. After playing with one for a few brief moments its status as a developer-only device has been cemented by sheer lack of functionality included, though it did feel rather comfortable in the hand. RIM CEO Thorsten Heins is in the middle of his BlackBerry World keynote address as you read this, so stay tuned — we’ll keep you posted on anything new or interesting Mr. Heins shares with us.